A particular category within the collection of pig piggy banks is the so called ‘green series’, piggy banks from Thüringen in which a piggy is always incorporated. They were used as genuine piggy banks, but even more often to put them in a collection in the showcases of the middle and upper classes in those years. 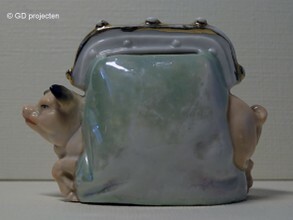 All of them are green glazed (not the pigs), that’s why this type of piggy banks is known as the ‘green series’. See the examples from the collection of Lothar Graff, president of EMBC (click photo). It is not quite sure who produced them, because of the lack of a hallmark. Experts have reason to believe that Conta und Böhme from Pößneck (Thüringen) made them. I recently bought the one on the photo via eBay.co.uk (! ), its my collection number 939.